NEWPORT BEACH — Ralph Rodheim is a well-known name around Newport Beach, thanks to his involvement in several organizations around the city — especially the Harbor Commission. He was a founding member of that city commission, which started out as a committee in 1998. This month, the commissioner will leave his post after serving 11 years — the longest term ever served by a harbor commissioner. The avid sailor and boating aficionado is a member of an advisory committee that shifted the status of the harbor from an amenity to a city priority. Rodheim was instrumental in the formation of the Harbor Commission when he, along with former commissioner Tim Collins and others, including John Corrough, approached the city’s Newport Harbor Water Quality Committee with suggestions on forming a committee dedicated solely to harbor-related issues. His involvement on issues pertaining to the bay began as a member of the Newport Beach Chamber of Commerce, which at the time had a marine division. With the city council’s go-ahead, the Newport Beach Harbor Committee was established in 1998, and it eventually evolved into the Harbor Commission in 2001. Each member was required to draw straws to accept one-, two-, three- or four-year terms on the commission. Rodheim pulled a three-year straw for committee service. When the committee became the Harbor Commission, commissioners were allowed to serve two consecutive four-year terms — so, his luck of the draw put him in a position that allowed him to serve the longest. Throughout the years, each of the seven commissioners has played an important role in ensuring that the harbor continues to improve, whether that be through building more public piers, such as the Rhine Wharf, or establishing a long-term dredging plan. Rodheim’s civic pursuits and knowledge of sailing and the bay, along with his expertise in marketing, were instrumental in helping the commission meet its objectives. Since its inception, the commission has continued to develop recommendations for the harbor. Notable accomplishments include the development of Harbor and Marine Uses into the city’s General Plan, and Local Coastal Plan and Land Use Plan; the construction of the Rhine Wharf; adoption of the Harbor Waterfront Project Guidelines; the completion of the dredging in Lower Newport Bay; the publication of a visitors’ boating guide to the harbor; and realignment of the mooring boundaries. Among his proudest accomplishments are the installation of the public pier at the Rhine Wharf, the mooring realignment and better communication with the Orange County Sheriff’s Harbor Patrol. “Ralph Rodheim, truly a man of the sea, is an avid sail racer and is passionate about boats — particularly wooden boats, like his lovingly restored Rhodes 33, Madness,” said Harbor Commissioner Doug West. “I can’t think of anyone who is more involved than Ralph in a broad range of civic and philanthropic activities. Ralph’s passion for all things nautical, his complete dedication to our community and his appreciation of the harbor as our city’s greatest natural asset are the foundation of his years of tireless service to the Harbor Commission. “We all owe Ralph a great debt, for everything he has done to promote our harbor,” West said. Rodheim was first introduced to sailing at age 17, when he was invited to sail on a Rhodes 33. Bitten by the sailing bug, he enjoyed boating throughout his life, and he raced with his father in the Newport-to-Ensenada Race as a child. For sentimental reasons, he purchased Madness, the Rhodes sailboat he initially sailed on as a teenager. Rodheim and two partners in the boat rebuilt the classic and now race it in the bay. He spent two semesters at sea on a vessel that took him and fellow Chapman University students to various countries, as part of the Semester at Sea Program. Rodheim discovered a love of teaching and landed a job at a junior high school in Garden Grove, upon his arrival back in Orange County. There, he met his wife, Penny, who was teaching English at the time. Rodheim’s tenure at the school was cut short when drafted in the Vietnam War. Stationed in Augusta, Ga., where he underwent civic affairs training, Rodheim continued to sail on weekends at the local yacht club, aboard a Lightning. He and Penny moved to Irvine after he served three years in Korea as a civil affairs officer. Rodheim took a position at University High School, teaching psychology and social studies, and was the swimming and water polo coach. “Being a teacher was awesome,” he said. “The kids are great. And to this very day, I’m getting emails from former students.” His students at Irvine were introduced to sailing in 1972 when Rodheim formed the school’s first-ever sailing club. Among his students was Gino Morrelli, who went on to become an internationally known catamaran designer who has helped create cutting-edge America’s Cup boat designs. During Rodheim’s 13 years of teaching at various high schools in the Irvine school district, he was involved in community organizations, including the Irvine Chamber of Commerce. After teaching, Rodheim pursued a career in marketing, working for the Irvine Co. in community relations. He left the company in 1984, when he helped found West Mark Savings Bank. He ultimately founded his own firm — Rodheim Marketing Group — 23 years ago, and he is also owner of Boat Rentals of America. Rodheim’s resume in civic engagement is extensive. 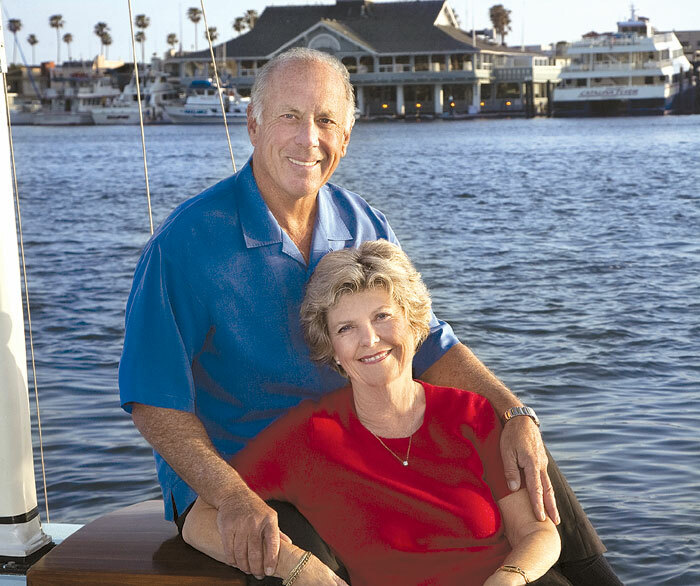 He has served on the Balboa Island Improvement Association and the Newport Beach Chamber of Commerce and he is a past chairman of the California Boating and Waterways Commission, serving in 1988. As the sun sets on his 11-year term, Rodheim shows no signs of slowing down as he turns his attention to his pet project: bringing a performing arts center to the city. He is currently serving as president of the Balboa Improvement District and sits on the capital campaign committee for the Balboa Performing Arts Center. He also continues to manage Rodheim Marketing Group and Boat Rentals of America. And, of course, he races in local yacht club events. To Rodheim, the most important upcoming harbor issue is alternative mooring opportunities, specifically the “Duffy Dock.” Former harbor commissioner Marshall Duffield presented the commission with a proposal for an all-fiberglass dock system to replace existing moorings. It would have the capability of securely and conveniently accommodating several vessels of different sizes. “The offshore mooring system is antiquated,” Rodheim said. “This concept is really critical to open up the water and to offer mooring holders something better. “I hope the future commission doesn’t let that issue drop,” he added.